South Korean defense officials have ruled out the possibility that The Cheonsan was hit by an internal explosion. Seoul, South Korea (CNN) -- As South Korea awaits the release of an official report into the sinking of a warship Thursday, a range of leaks and unofficial statements is pointing the finger firmly at North Korea. The findings of an official report into the cause of the incident -- prepared by American, Australian, British and Swedish, as well as South Korean experts -- will be announced late Thursday morning. On Wednesday, Foreign Minister Yu Myung-hwan said, in response to a question from reporters attending an economic briefing with EU officials, that it was "obvious" North Korea had sunk the ship. The Cheonan, a 1,200-ton corvette, sank after a mysterious explosion ripped it in half on March 26 in disputed waters off North Korea. Forty six sailors were killed or lost. Also on Wednesday, local and international media were invited to view the hull of the ship -- blown in two -- at Pyeongtaek Naval Base, the Cheonan's home base south of Seoul. On the same morning, South Korea's Yonhap news agency, quoting unnamed officials, stated that pieces of a torpedo, with serial numbers marked in a font used in North Korea, have been discovered. 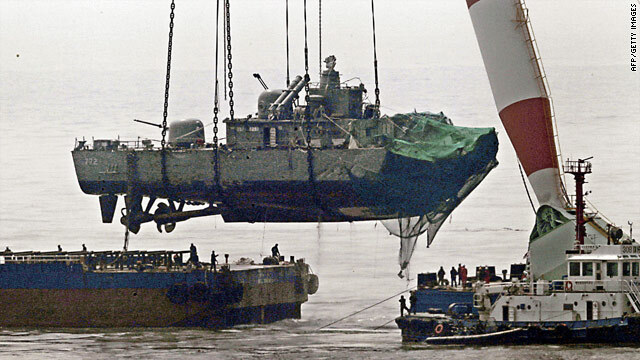 The Yonhap report also said that traces of explosive found in the Cheonan's wreckage were identical to those found in a North Korean torpedo that washed up on the South Korean coast seven years ago. A defense ministry source confirmed to CNN that parts of what appeared to be a torpedo propellor had been found, but declined to comment further, pending Thursday's announcement. South Korean Defense Minister Kim Tae-young said last month that a non-contact torpedo was the most likely cause of the tragedy. In the weeks since the sinking, a range of possible causes for the tragedy have been excluded. A sea mine was originally thought to be a possible culprit, but no mines have been found in recent years in the Yellow Sea -- a piece of water commonly frequented by fishing boats from China and the two Koreas, as well as by naval patrols. An internal explosion was discounted after both sections of the hull were raised, and it was seen that the damage was consistent with an external detonation. North Korea has denied any responsibility for the sinking.